WASHINGTON (AP) — House Speaker Paul Ryan said Wednesday that Congress “shouldn’t step in the way” ahead of a meeting between President Donald Trump and Deputy Attorney General Rod Rosenstein. 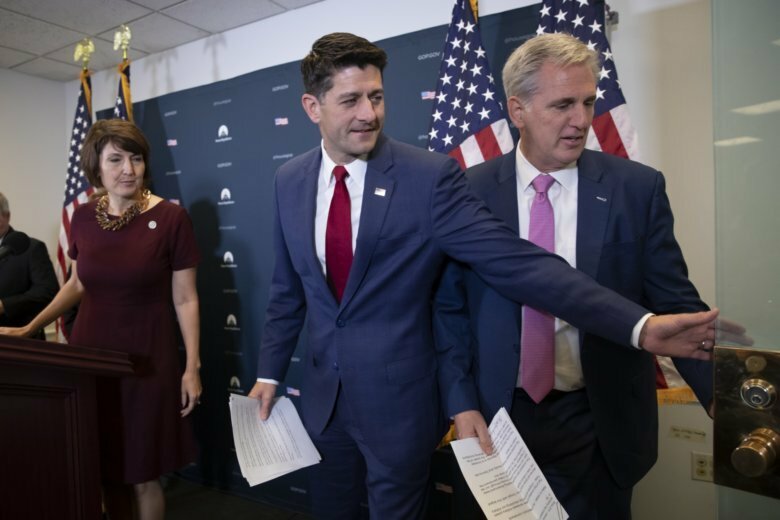 Ryan’s comments Wednesday came after the conservative House Freedom Caucus pushed for Rosenstein to testify before the House Judiciary Committee. North Carolina Rep. Mark Meadows, who heads the caucus, said Tuesday that the group wants Rosenstein to answer questions about reports last week that Rosenstein had floated the idea of secretly recording Trump after FBI Director James Comey was fired in 2017. Meadows on Tuesday tweeted, “Rosenstein should come before the House Judiciary Committee within the week and testify under oath about his alleged comments, or he should resign immediately.” But House Judiciary Committee Chairman Robert Goodlatte hasn’t said whether he will call Rosenstein to testify. Ryan was asked Wednesday if he supports legislation introduced by Democrats to protect the Mueller investigation and if he thinks Rosenstein should testify. Asked again if Rosenstein should testify, and if he should be sanctioned if he doesn’t, Ryan said he’d defer to the Judiciary Committee. In July, Meadows threatened to try to force a vote on either impeaching Rosenstein or holding him in contempt of Congress. He paused that effort just before the August recess, but he has said he may still pursue it if the Justice Department doesn’t provide thousands of documents Republicans want related to the Russia investigation. Meadows, Ryan and Goodlatte met late Wednesday to discuss a possible hearing. In interviews afterward, Goodlatte and Meadows would not say what they had agreed to. But Meadows said he would not file an impeachment resolution Wednesday evening and said he would be satisfied if the House held a hearing next week, even though the House is not expected to be in session. Although Goodlatte’s position on a hearing is unclear, the panel is preparing subpoenas of memos written by former acting FBI Director Andrew McCabe that detail conversations around that time with Rosenstein and others, according to a person familiar with the plans but not authorized to discuss them. Goodlatte has not commented on the memos. Questions about Rosenstein’s future were revived after a New York Times report that in May 2017 discussions with FBI and Justice Department officials he suggested the idea of secretly recording Trump — remarks his defenders insist were merely sarcastic — and of invoking the Constitution to have the Cabinet consider removing Trump from office.